More and more people are concerned about using cookware and appliances with Teflon nonstick surfaces. The use of waffle makers is no exception. When we did our research on buying the best waffle makers, we have come across the following question quite often: “Does this waffle maker have a Teflon nonstick coating?” Many customers were on the search for a Teflon-free waffle maker due to health concerns. We have done our thorough research to find some alternatives but also did some research if Teflon is bad for your health. Two options will give you some peace of mind. Firstly, you could go back to the basic and use the good ole waffle irons for the stove top. These are usually made of cast iron and are safe to use. The other alternative is waffle makers with a ceramic nonstick finish. Oster has a few waffle makers with a Dura ceramic finish which they claim is four times more durable than Teflon, doesn’t flake or peel and is free of PFTE and PFOA (we will explain these terms at the end of the post). Over the last few years, more companies have listened to their customer’s concerns regarding nonstick coating containing Teflon. They have replaced Teflon with a ceramic coating that is free of PTFE and PFOA. Some customers are worried about the safe use of ceramic as a nonstick coating. Here is a link to a well-researched article to get more information if a waffle maker with a ceramic coating is safe to use. We have found three electric waffle makers that have received good reviews on Amazon and are free of Teflon coating. 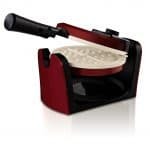 The Presto FlipSide Waffle Maker is a popular choice for many customers on Amazon with over 5000 sold items. You can read our review here. Thank you for your question. 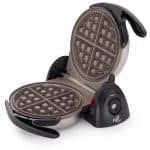 The current waffle makers are now made with a ceramic finish. PTFE is not a component used in ceramic finishes. This is a chemical used in non-stick finishes (such as Teflon and other non-stick surfaces) to actually make the coating non-stick. This answer will give buyers who are looking for a Teflon-free coating great piece of mind. 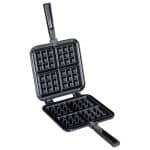 The Presto Waffle Maker is a great option for health conscious people who are looking for a compact, easy to store appliance that also produces thick and fluffy Belgian waffles. There are a few flaws with this waffle iron we would like to mention. There is no temperature adjustment, and some customers complained about waffles getting stuck. The timer works separately with batteries. Overall, the Presto Flipside waffle maker is a great option for everyone who is looking for a PTFE free nonstick cooking surface. Here is another great waffle maker that features a ceramic nonstick surface. Oster claims that the DuraCeramic coating is 4x more durable than Teflon, cooks 20% faster and doesn’t flake or peel. The surface is also more scratch resistant. Most importantly the coating is free of PTFE and PFOA. The Oster Belgian Waffle Maker also has green and red indicator lights plus you can adjust the temperature for lighter or dark browned waffles. Most customers have confirmed the quality of the ceramic coating, but some had trouble to get the waffle iron to a hot temperature. There might be a problem with the thermostat in some products. Please check your appliance straight away. 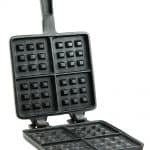 Overall, the Oster is a solid waffle iron that makes yummy Belgian style waffles. 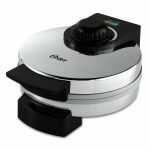 In addition to the Oster waffle maker we discussed before, the Oster Eco has a flip option to cook the waffle evenly. It heats up quickly, and we love the candy apple red color. It is a nice change from black or stainless steel. For easy storage, you can put the waffle iron vertically. The biggest flaw with this product seems to be the handle. Customers have found it flimsy, and some even experienced the handle to come off. The good news is that Oster offers a one-year warranty so if you have any trouble get in touch with the customer service straight away. A stove top waffle iron is fantastic in various ways. Our top choices are not only PTFE and PFOA. You can use them without worrying electrical cords and bench top space. They take very little storage space in your kitchen cupboard. For easy cleaning put it in the dishwasher or wash it by hand. But of course, there are also some cons. There are not suitable all stove top surfaces. The handles can get very hot (only for cast iron). There is a learning curve involved to make the perfect waffle. These waffle irons are best suited for a gas burner or electric stoves. You can even take them on your next camping holiday especially the cast iron waffle maker. The Nordic Ware wouldn’t be suitable for open fire with the cast aluminum material. The Nordic Ware wouldn’t be suitable for open fire with the cast aluminum material and plastic handle. Make sure to stick to some safety precautions and wear heat resistant gloves. Another thing to keep in mind is that the cast iron handle will get hot so always wear oven mitts to prevent getting burned. Nordic Wave is well-known and an established family owned company which has been founded over 70 years ago. I do like the fact that they are producing their quality products in the United States. The cast aluminum waffle iron fits perfectly in the Nordic Ware high-quality product range which is backed up by a five-year warranty. The waffle iron is best suited either for a gas or an electric stove top. As you can see on the picture, you can separate the waffle iron to heat it up on both sides at the same time but also for easier cleaning. 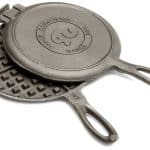 The Nordic Ware waffler has a nonstick coating which is free of PTFE (Teflon) and PFOA. It still needs to be brushed with some cooking oil before you put the batter in. Is your nonstick coating safe and does it contain TEFLON? Overall, we love this product. It takes a bit of a learning curve to get used to it, but the results are worth it; beautiful large, fluffy and thick Belgian style waffles. This cast iron waffle maker is great for the gas stove or even the campfire. It is not as big as the Nordic Ware waffle maker; the waffle squares each measure 3″ x 3″. The hinges are interlocking, so it is easy to take them apart and put them on the stove at the same time. To prevent the waffles from sticking it is imperative to pre-season the cast iron before using it. The handles get very hot while on the stove so please wear oven mitts. Also, please remember to flip the waffle iron for even cooking. Overall, this is a basic waffle iron, just like in the good old days. The Rome waffle iron is made from cast iron and is best suitable for gas burner stoves and also camp stoves. It produces 6″ round waffles who are very thin just like American-style waffles. Before the first use make sure to preseason it properly to clean off the protective wax. The waffle iron comes with instruction on how to do it. Just like the other stovetop irons, you will need to preheat both sides on high heat before you can put the batter in. After two or three minutes of baking, flip the waffler and bake the other side. Please use oven mitts because the cast iron handles get very hot. Some customers found it difficult to remove the protective wax. Others also had problems to get waffles out of the iron. Overall, the Rome waffle iron needs some practice to master. Throughout our post, we have mentioned the terms Teflon, PTFE, and PFOA quite frequently. Now it’s the time to explain it a bit further. Teflon is a registered Trademark name owned by Chemours (formerly DuPont) and describes the use of the well-known nonstick coating used on the companies cook and bakeware. Teflon is based on a chemical formula called Polytetrafluoroethylene (PTFE). Another chemical used in the process of making Teflon is called PFOA which stands for Perfluorooctanoic acid (also known as C8). PFOA is only present (if any) in small amounts since it gets burned off during the process of making Teflon. Teflon itself is not suspected of causing cancer. Regarding PFOA, the long-term effects are largely unknown. For more details please read here. Something to bear in mind is that you should avoid overheating pans that are Teflon-coated because there is a risk of developing flu-like symptoms from breathing in the fumes. There are great alternatives out there for waffle irons that are free of Teflon-coating. You can either get back to the basic and choose a stove top waffle iron which is made from cast aluminum or cast iron. Another advantage of these waffle irons is that there are easy to store and don’t rely on electricity. There is still a learning curve involved and they might not be suitable for all kinds of stove tops. If you rather use an electric waffle maker, you’ll find more and more waffle makers with a ceramic coating which are free of PTFE and PFOA. We think that is fantastic that well-known brands offer these options to their customers. Customers can now make an informed decision about appliances they would prefer whether it is a frying pan, cookware set or, in our case, a waffle maker. Please share your thoughts on this matter in the comment section below.